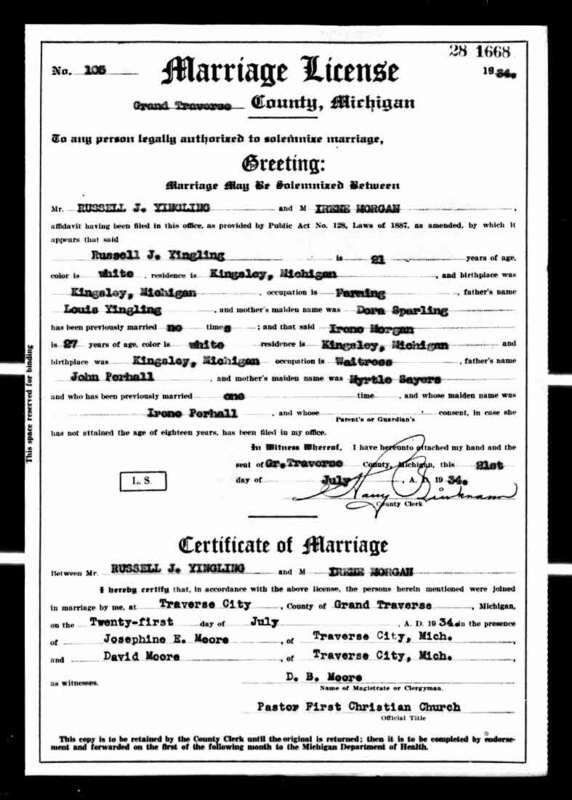 Marriage* She married Russell Jay Yingling, son of Louis Yingling and Dora Sparling, on 21 July 1934 in Traverse City, Grand Traverse County, Michigan, United States. Burial* She was buried in Foster Memorial Cemetery< Scott Twp., Ontario County, Ontario, Canada. Birth* Annie Morris was born on 1 November 1902 in York County, Ontario, Canada. 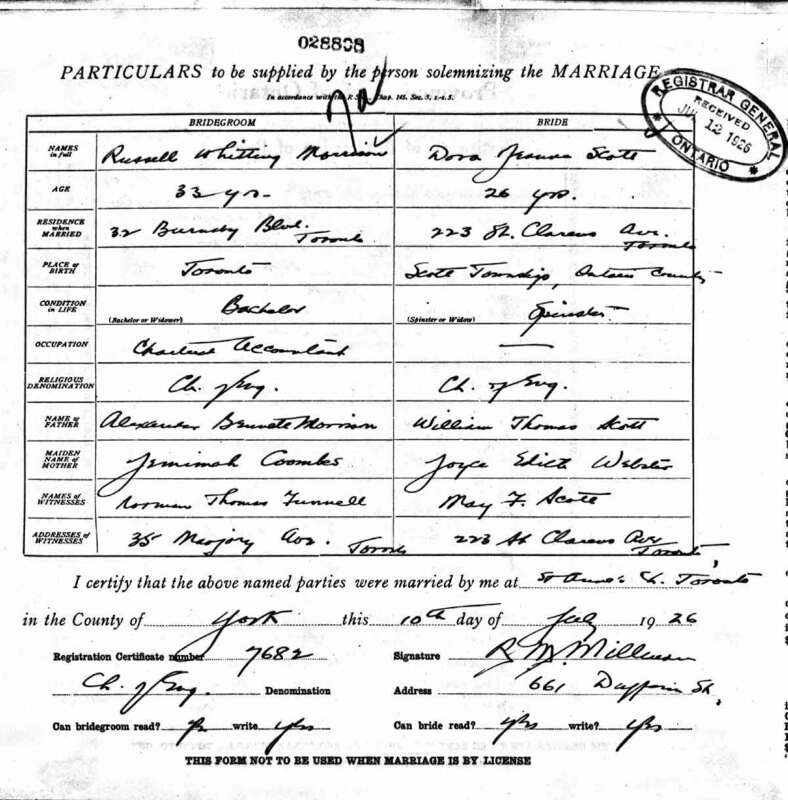 Marriage* John Morris married Harriet (Hattie) A. Shier, daughter of Augustus Shier and Martha Hurren, on 11 December 1907 in Georgina Twp., York County, Ontario, Canada. 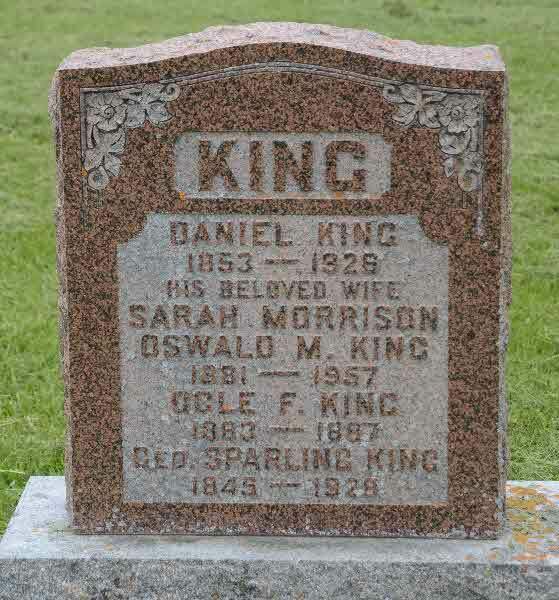 Marriage* He married Alice Margaret Mae Teskey, daughter of Alexander Marshall Teskey and Jessie Catherine Litster, on 6 June 1934 in Medonte Twp., Simcoe County, Ontario, Canada. 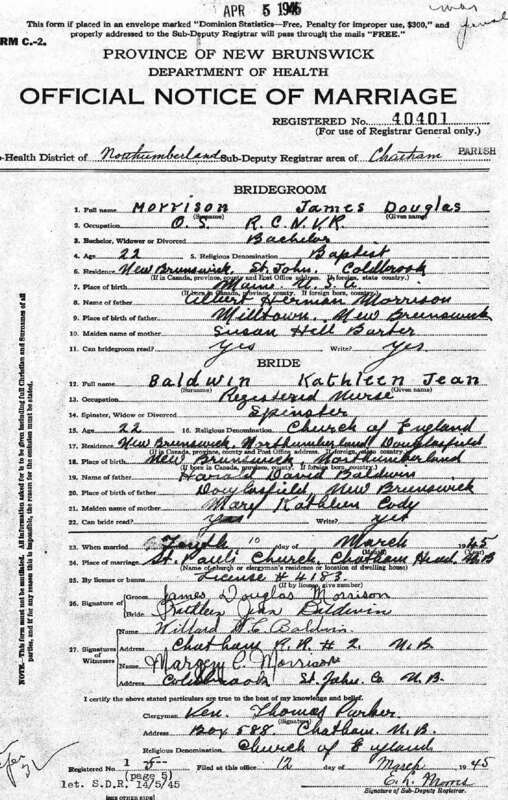 Marriage* James Douglas Morrison married Kathleen Jean Baldwin, daughter of Harold David Baldwin and Mary Kathleen Cody, on 10 March 1945 in St. Paul's CHurch, Chatham Head, New Brunswick, Canada. Death* James Douglas Morrison died on 31 January 2015 in Upper River Valley Hospital, Waterville, New Brunswick, Canada; ames Morrison passed away at the Upper River Valley Hospital in Waterville on January 31, 2015 after a lengthy illness. 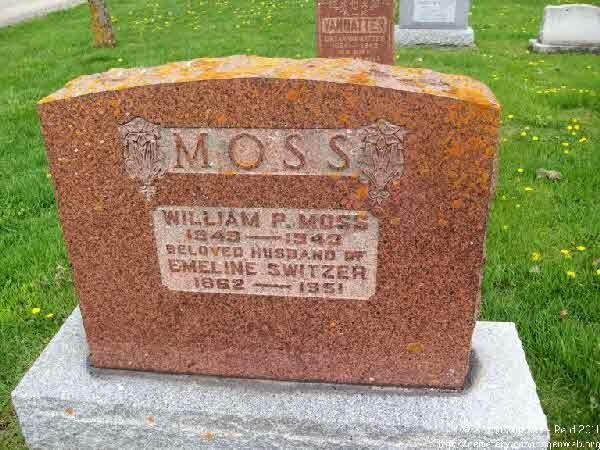 He was the son of Albert Herman Morrison and Susie (Barter) Morrison. Jim is survived by his wife of 69 years, Kathleen (Baldwin)of Hartland, daughter Beth MacFarlane (Robert A.) of Wakefield, sons Bruce (Kim) of Jacksontown, and Ian (Susan) of Nelson, BC. 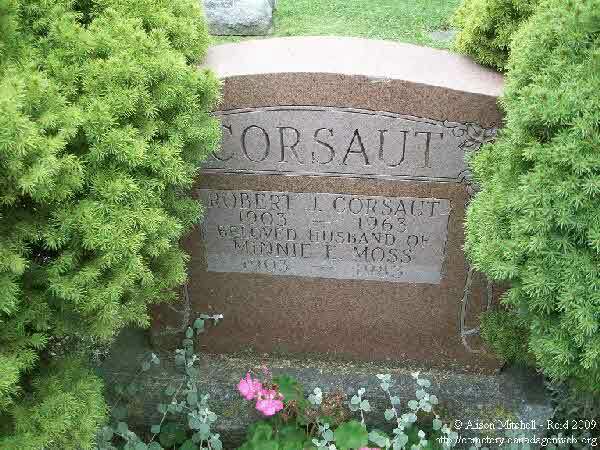 He is also survived by his sister, Margery Marshall of Brampton, ON as well as his grandchildren Marshall (Karole) MacFarlane of Arizona, Douglas (Mary) MacFarlane of Wakefield, Neallie (Ed) Rodriguez of Woodstock, Whitney Morrison of Saint John, Erin Morrison of Nelson, Jessa Morrison of Calgary, and Haley Morrison of Vancouver and great-grandchildren Tressa MacFarlane (Dan Wright) of Hartland, Justin MacFarlane (Caitlin Avery) of Hartland, Mikaela MacFarlane of Arizona, and Henry Morrison of Nelson. He is also survived by several nieces and nephews. Jim was predeceased by his parents, brother Bob Morrison, and infant brother, Hugh. A celebration of Jim’s life will be held on Saturday, April 25, 2015 at the Carleton Funeral Home Chapel at 11 AM. Interment will be held at a later date. 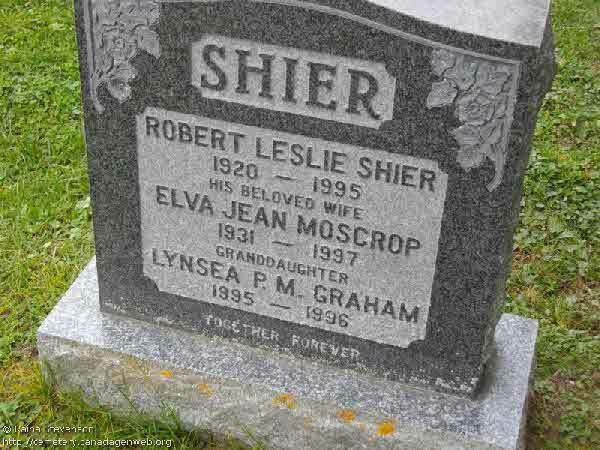 Marriage* She married William H Shier, son of John Shier and Elizabeth Jane Rowntree, on 24 July 1899 in Oden, Emmet County, Michigan, United States. 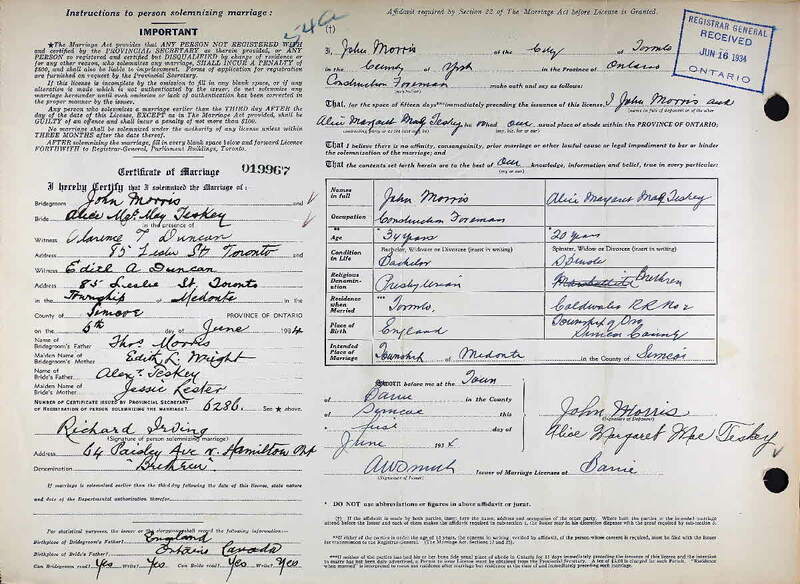 Marriage* He married Dora JEANNE Scott, daughter of William Thomas Scott and Joyce EDITH Webster, on 10 July 1926 in Toronto, York County, Ontario, Canada. 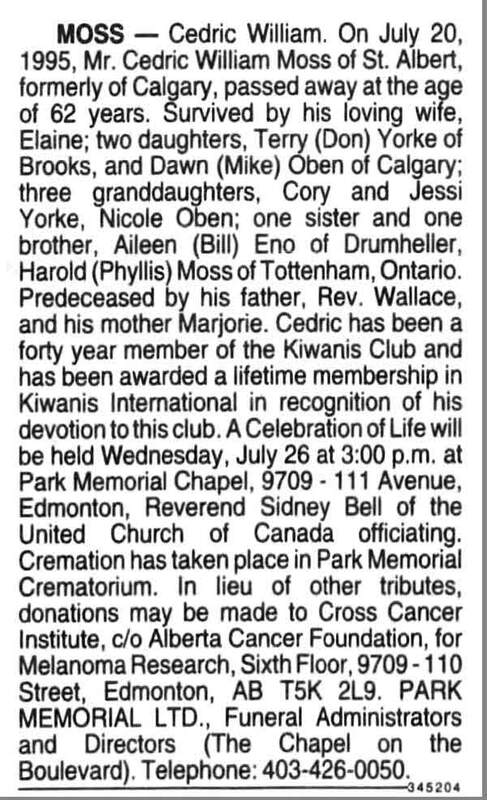 Death* Cedric William Moss died on 20 July 1995 in St. Albert, Alberta, Canada, at age 62. Death* Marion Shipley Moss died on 30 July 2008 in Victoria, British Columbia, Canada, at age 83; With sadness Marion Boldt’s family announce her passing in Hospice, Victoria, B.C. She will always be lovingly remembered by her husband, Peter; children, Bob (Sue) Lucy, Cathy (Pete) Oleson, and Jan Lucy (Don Evans); step-children, Anne (Lorne DeGirolamo), Jeanne, Rob, and Don (Tere Calderon de la Barca); grandchildren, Valerie, Mitchell, Shannon, Devon, Vincent and Omar; step-grandchildren, Savannah and Peter; sister, Eleanor (Dennis) Hollingshead. Growing up in Edmonton, Marion attended the University of Alberta and continued her education at the University of Western Ontario where she received an M.Sc. in Botany. She taught at Queen’s University and worked as a researcher at the Experimental Farm in Ottawa before marrying her first husband, George Lucy. They lived in many places including Germany, enabling them to explore much of Europe before moving to Ottawa where they lived until George’s death in 1972. In 1976 Marion married George’s long-time friend, Peter Boldt, and moved to Victoria. One of the highlights of their life together was a yearlong boating trip down the Mississippi. They also had opportunities to visit many countries with a particular favourite of hers being China. Marion’s thirst for knowledge continued throughout her life. Her varied interests included nature, creative pursuits, church life and in recent years, learning to play the flute. She had the ability to make everybody feel special. Thank you to Dr. Elizabeth Grant and the wonderful staff and volunteers at Hospice. 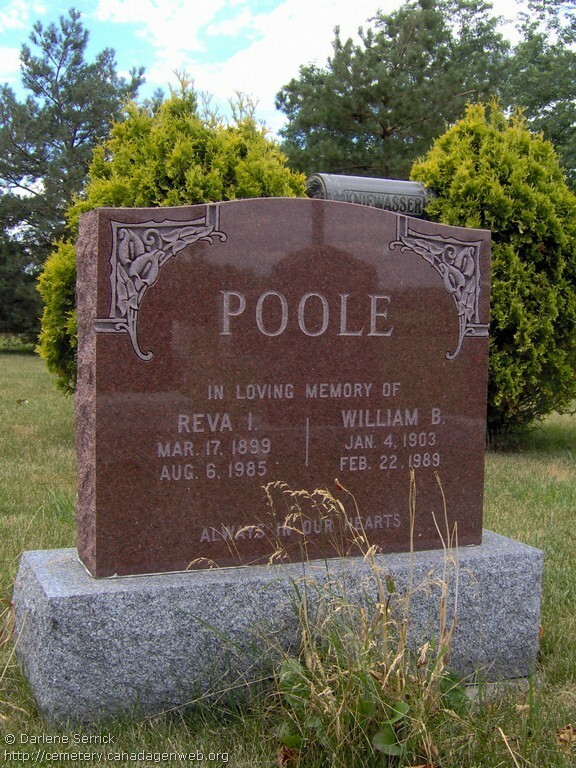 Burial* She was buried in Medway Decker Cemetery, Middlesex County, Ontario, Canada. 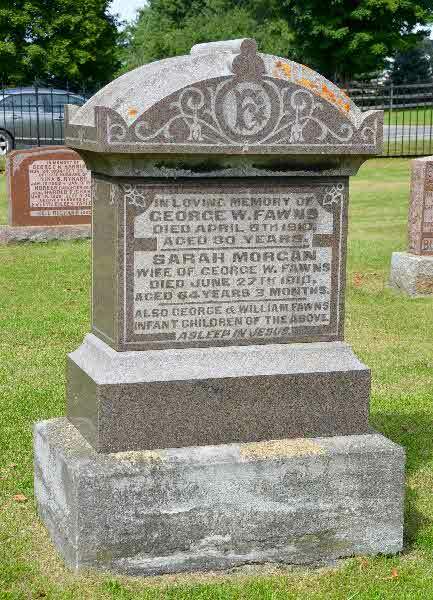 Burial* She was buried in Rock Chapel Cemetery, West Flamborough Twp., Dundas, Wentworth County, Ontario, Canada. 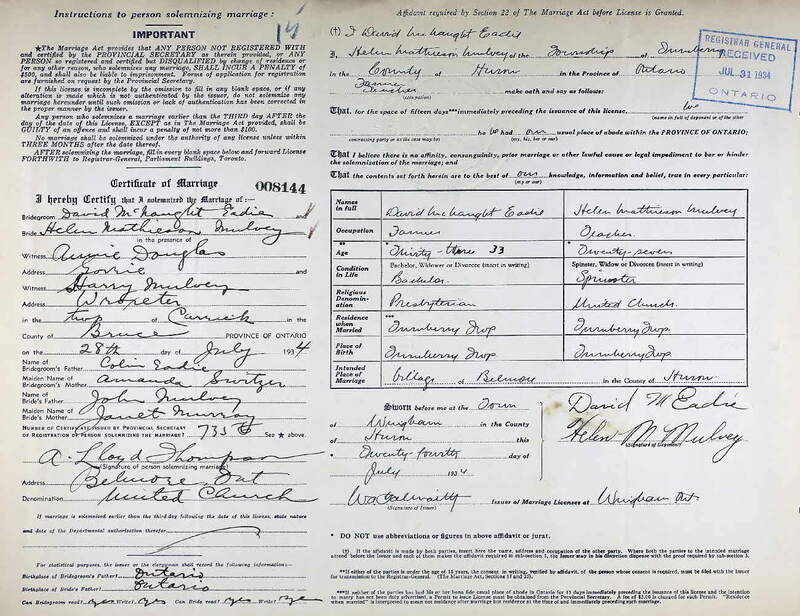 Marriage* She married David McNaught Eadie, son of Colin Sharpe Eadie and Amanda Louise Switzer, on 28 July 1934 in Carrick Twp., Bruce County, Ontario, Canada. 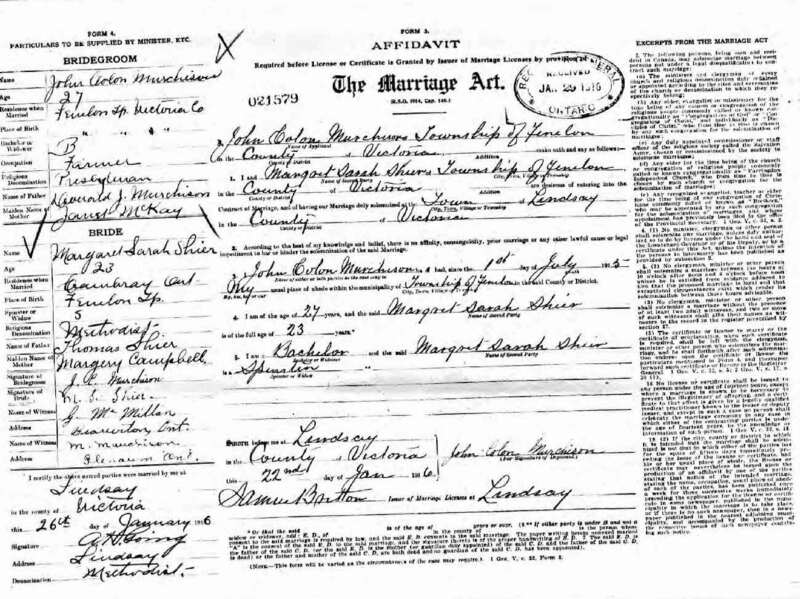 Marriage* John Colon Murchison married Margaret Sarah Shier, daughter of Thomas Shier and Margery Campbell, on 26 January 1916 in Lindsay, Victoria County, Ontario, Canada. 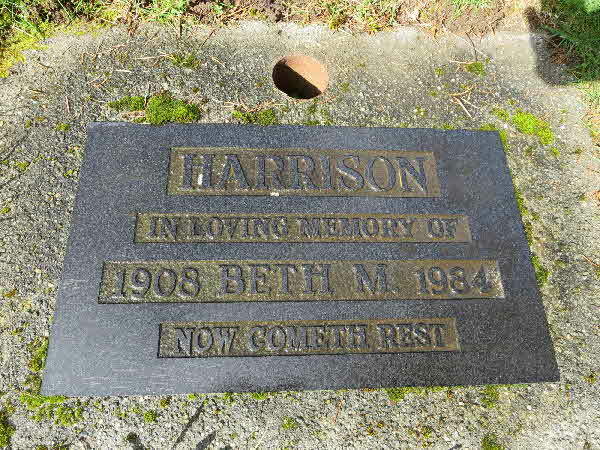 Burial* She was buried in Murray Cemetery, Langley, Greater Vancouver Regional District, British Columbia, Canada.